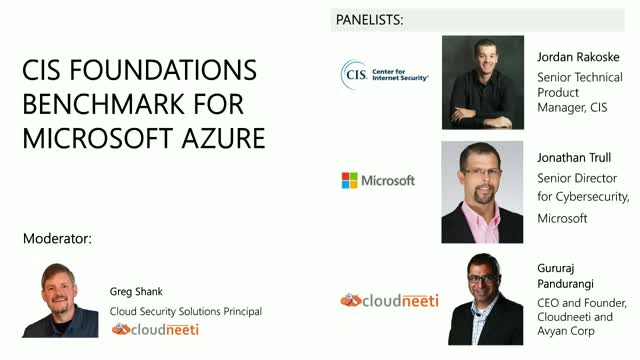 Recently the Center for Internet Security (CIS) published the CIS Azure Foundations Benchmark, the first ever set of security configuration best practices for Microsoft Azure. These industry-accepted best practices go beyond the high-level security guidance already available by providing Microsoft Azure customers with clear, step-by-step implementation and assessment procedures. · Who is CIS? How the CIS Benchmarks remove guesswork for security professionals? · What is CIS Azure Foundations Benchmark? Why Azure decided to use CIS Foundations Benchmark? · How these security checks can be seamlessly integrated into an organization’s security and audit ecosystem with an array of security tools and solutions. CIS Benchmarks have been the de facto standard for prescriptive, industry-accepted best practices for securely configuring traditional IT components. The release of the CIS Azure Foundations Benchmark into this existing ecosystem marks one of many milestones for the maturation of the cloud and its suitability for sensitive and regulated workloads.